Be comfortable in your own skin. It shows! Maybe your arms aren’t as toned as they used to be, or your clothes don’t fit quite right anymore. Restore your self-confidence – it’s invaluable! 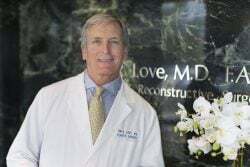 Dr. Tim Love's experience, expertise, credentials and dedication to his patients’ well-being make him a well-respected provider of surgical cosmetic procedures in Oklahoma City. It’s your body: own it. Whether you’re looking to accentuate a facial feature or sculpt your body, Dr. Love will to give you a naturally beautiful look with safe cosmetic surgery procedures bringing out the best you. Let’s start the conversation. Call us today at (405) 751-LOVE (5683) or use our convenient online contact form below. Altogether, your face is your most identifying characteristic. It’s how you express yourself and it is how you are remembered. If injury or age has made you unhappy or embarrassed by your appearance, you don’t have to feel hopeless. Dr. Tim Love can listen to your dreams and goals for your face and can change your outlook on life through facial cosmetic surgery and other treatments. Restore your self-confidence, look younger and more healthy, correct medical problems – the benefits of cosmetic plastic surgery are real and you can realize them with Dr. Tim Love. Many factors can diminish your opinion of how your body looks. Childbirth, aging, injury and even diseases like breast cancer can all alter your appearance in ways that hurt your self-esteem. Your reasons for exploring cosmetic surgery to improve the appearance of your bust are very personal. It’s important you seek a cosmetic surgeon that combines a personal, confidential approach with the state-of-the-art technology, techniques and expertise that can give you fantastic results – a cosmetic surgeon like Dr. Tim Love. Pregnancy and childbirth changes a woman’s life in many ways – and every woman’s experience is unique, especially when it comes to post-childbirth changes to her body. A Mommy Makeover from Dr. Tim Love can offer a unique array of cosmetic treatments that address areas like the breasts and tummy. Your lifestyle, genetics and other factors will play a role in your outcome as together, Dr. Love and you create a plan that enhances your unique features in pursuit of a more toned, youthful YOU!